We would like to invite you to come be "OUR GUESTS" This is YOUR vacation so be sure you get a unit with a GREAT VIEW, 4th floor, only 4 doors from CENTER POOLS. Welcome to the sugar white sands. THE SUMMIT IS THE PLACE TO BE! Condo ON The Beach! WEEKLY RENTALS available.YOU MUST BE 23 TO BOOK. I book in out 5 nights minimum.Check in is on Sat only. This unit has a new beauty rest mattress, large capacity washer/ dryer, new carpet,new kitchen cabinet doors in Dec 2017.New chandilier. I DONT have new pictures yet. It is fully furnished with linen, fully equipped kitchen and crockpots. .MAXIMUM GUESTS 6. King bedroom, queen sofa sleeper, set of twin bunks.This unit is PRIME VIEW of everything! Walmart is only 0.4 mile away. IT is NEXT DOOR TO the Hottest Beach clubs, CLUB LAVELA , which is the 'Worlds largest' Beach Club, Spinnakers AND THE FAMOUS PINEAPPLE WILLIES. .Summit is truly self contained.We have Wi-Fi, Shuffleboard Courts, Poolside Tiki Bar, Bikini Bob's Poolside Restaurant, The Summit Snack Shack Convenience Store & Ice Cream Shop, Parasailing & Jet Ski Rentals, 610 feet of Beachfront, Kids Playground on the Beach, Volleyball, 2 Olympic size pools, 2 kiddie pools, 3 Hot Tubs, Fitness Center & Sauna, Gated Community with Security ATM, Arcade, and more facilities on site and in the immediate area than any other resort in Panama City Beach. I also have a set of chairs and and UMBRELLA in my closet that you may take down on the beach. All i ask is that you risnse them off first. Beach chairs with umbrella on the beach. What a view and only 4 doors from CENTER POOLS. Parasailing and jet ski may be rented. I am an R.N. and vacationed in Panama City Beach as a child with my family. I just love the beach, the sound of the ocean. I am married, have 3 sons, 6 grandchildren. I think it~s nice to be able to see who you are renting from. I feel as if i know a lot of you. The tiki bar is great. The summit is self contained and has an on site restaurant, store and is so close to Walmart! We have a play ground for the kids, game rooms, ice cream parlor and so much more. I like that i can see the ocean from any of our units.Most popular spring break place to STAY!! Watching the waves,sea gulls, and people walking on the beach from the balcony while sipping coffee. Awesome view of the pools and beach from the balcony! 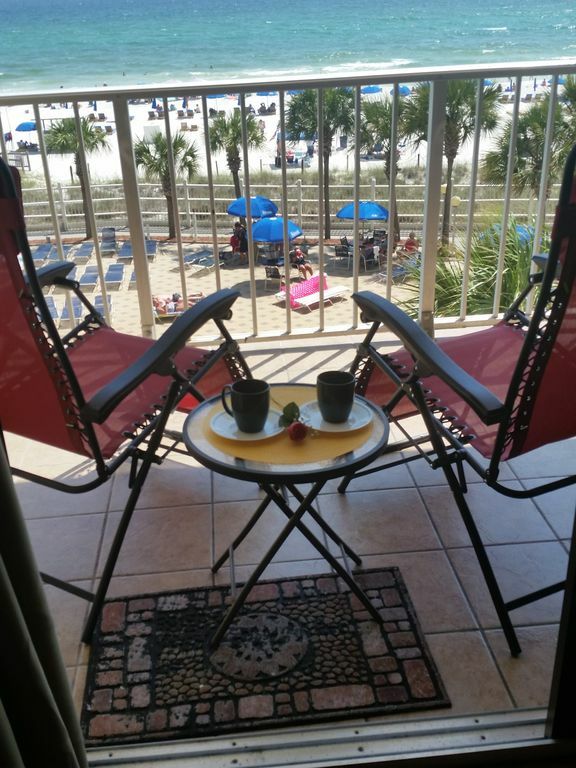 SITS DIRECTLY "ON THE BEACH"
All linens provided. I requiest that you bring your own beach towels. Never got inside the property. Had to try to find other accommodation at 10pm at night. Disaster! Thank you for renting from me.You were great guest. The owner did not provide a secure condo- reported broken window lock upon arrival and took her over 24 hours to secure property with new lock. Window opened to main walkway allowing easy access to unit. Dryer motherboard went out per owner, after she had condo maintenance look at it, and she literally told us we had to leave and refused to refund the rest of the stay. First and last time I will use VRBO. Never again want to be at the mercy of an unscrupulous owner. I think if you look at all my 5 Star reviews, you may see something wrong.When a guest wants maintaince ASAP and text and call me 17 times in 4 days something could be wrong with the guest. She did not say i sent her $975 back out of $1116.75. When you are tearing up out unit , you have to go. NEVER had a guest like this.She stayed 5 nights for $141.00.She text around Midnight and said the washer was not . About 5 min later she said it is the water is coming in. Everything is clean in our condo. My question is why are you washing at Midnight right after checking in. Did you bring dirty laundry ?The maintaince said window was fine but you have to have knowledge of how to lock a window. The guests were wonderful ! Could not have asked for more perfect guests. See you next year. Mrs. Dorothy was beyond helpful and very friendly. The room was just like being at home and had zero problems. Couldn't have asked for anything better. I will definitely be back. Cancellations less than 60 days,NO REFUND. Summit charges a one time parking fee for parking and arm bands $17.00.PLEASE DO NOT MAKE A DEPOSIT OR BOOK IT UNTIL I HAVE ACCEPTED THE BOOKING, sometimes it books by phone and I have not had a chance to up date calendar.